Arizona Pedestrian Laws You May Not Know | Phoenix Personal Injury Law Blog - Breyer Law Offices, P.C. No matter what city you live in, Arizona is a beautiful place to experience on foot. But whether you’re making your way to the nearest hiking trail or you’re just trying to get to work on time, there are rules of the road for pedestrians just as there are for motor vehicles and cyclists. It’s important for pedestrians to review these rules so they can make sure they’re staying within the law. And even more importantly, so they can make sure they’re staying safe. Many pedestrians mistakenly believe that they always have the right-of-way when walking among motor vehicles. Not always. So what about crosswalks? Cars approaching crosswalks must provide the right-of-way to pedestrians who are passing in the half of the crosswalk that is in front of the vehicle. If a pedestrian is close to approaching the half of the crosswalk that the vehicle is approaching, the vehicle must come to a full stop and allow the pedestrian to pass. If a vehicle is stopped at a crosswalk to allow a pedestrian to pass, another vehicle may not go around the stopped vehicle in order to pass it. But the pedestrian has obligations, too. Although pedestrians aren’t required by law to approach crosswalks cautiously, they should, making sure no car is about to pass through just as they step out onto the street. However, Arizona law does say that at no time, even when entering a crosswalk, should a pedestrian step out so quickly in front of a vehicle that a vehicle does not have time to come to a full stop. So crosswalks are one place where pedestrians have specific restrictions. But a pedestrian always has the right-of-way on sidewalks, right? Yes, that is true. But some pedestrians don’t use sidewalks properly. For instance, if there is a sidewalk, it is actually against the law for pedestrians to walk in the roadway, even if they are keeping far to the shoulder and not walking into a vehicle’s path. If a sidewalk is there, it must be used; that is the law. If an overhead pedestrian tunnel or bridge is provided to let pedestrians cross, these passageways must be used. The pedestrian cannot cross the road another way. Sidewalk law also applies to pedestrians who are trying to solicit a ride from a driver. Under this law, those trying to obtain a ride from a friend or taxi should try to hail the ride from the sidewalk, or phone ahead of time for pickup. While hitchhiking is not illegal in Arizona, this too must be done at the shoulder or curb of the road, without the hitchhiker actually entering the roadway. If there is no sidewalk provided, pedestrians may walk on the roadway. Many think that everyone on the road has to travel in the same direction as traffic—vehicles, cyclists, and pedestrians. But in fact, pedestrians who are walking in a road must travel the opposite direction of vehicles. This is so that pedestrians are more visible to motor vehicles, and so that motor vehicles are more visible to pedestrians. While the term “jaywalking” never actually appears in Arizona law, the law is very clear when it comes to pedestrians crossing the road. Within the state, crossing may only be done at intersections with clear traffic signals and/or clearly outlined crosswalks. At no time should pedestrians dart or jump out in front of traffic, particularly when there is not a designated space for them to do so. Remember – runners are considered pedestrians, and all runners are expected to follow the same laws set in place for pedestrians. However, even when you follow the rules of the road and walk (or run) cautiously, accidents can still happen. Motorists may speed and be unable to slam on the brakes in time, or they may make a turn into a crosswalk while distracted by a phone, hitting you. 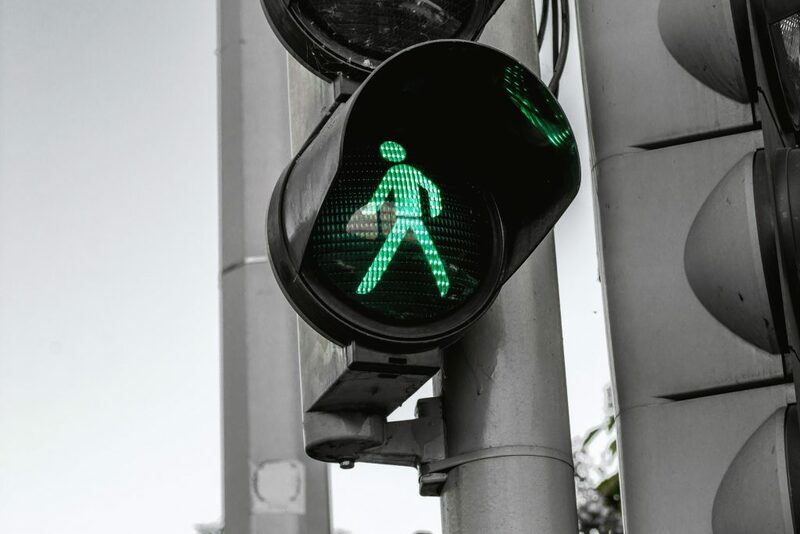 If you suffered a collision with a motor vehicle, our pedestrian injury attorneys at Breyer Law Offices, P.C., may be able to help you get the compensation you need to recover. Call (602) 267-1280 for a free consultation.